They say crime doesn’t pay – and that’s often true for the criminal underworld. But for police, crime can pay quite well, and in various forms of collateral. The Mexican state police in the city of Guanajuato, officially known as the State Public Security Forces, have recently announced that they have seized a slew of cars from criminals that will be put into service. 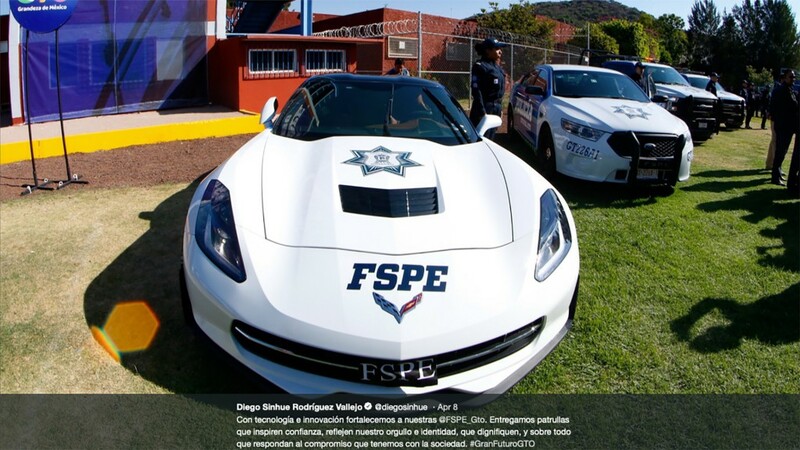 Vehicles include six examples of the Chevrolet Camaro, two undisclosed Cadillacs, one Chevrolet Corvette Stingray, and several other General Motors vehicles, according to photos posted to the Twitter account of Guanajuato Governor Diego Sinhue Rodríguez. Now, as you can imagine, not everyone is happy about the decision. The Green Party leader in Guanajuato, Sergio Contreras, said the new fleet announcement is a distraction from the city’s rising homicide rate. Contreras said the sale of the cars could have helped the police force purchase more useful equipment, adding that maintaining such high-performance vehicles can be expensive and that some officers may not be able to handle the high-powered performance cars. But Vallejo said that maintenance for the vehicles would be paid by seized property, including jewelry, cash, and real estate… also from criminals. This isn’t the first time nor will it be the last when police turn seized sports cars into police units. Some departments outright buy such vehicles from the get-go, forgoing the police work for a new, go-fast police cruiser. However, department budgets are often not flush with so much extra cash, so turning a seized sports car into a police pursuit vehicle sometimes makes more sense. And we’re sure that the officers may be somewhat excited to drive a sports car like the Camaro or Corvette, which is likely a welcomed change from the standard, drab police cruiser. Subscribe to GM Authority for more Corvette news, Camaro news, Chevrolet news, and around-the-clock GM news coverage.